Rooms from $136.08 per night. Blessed with upscale urban amenities southern friendliness and an outdoor pool in the city center our guests feel like VIPs at the super-stylish W Hotel Atlanta Downtown. The 15-story W Hotel Atlanta Downtown houses 237 sleek rooms with plush signature W bedding flat-panel TVs and iPod docks; Wi-Fi is available for a feee. 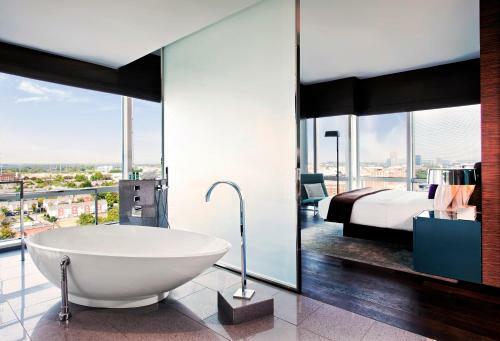 Bathrooms feature peek-a-boo showers fluffy robes rainfall showers and designer toiletries. 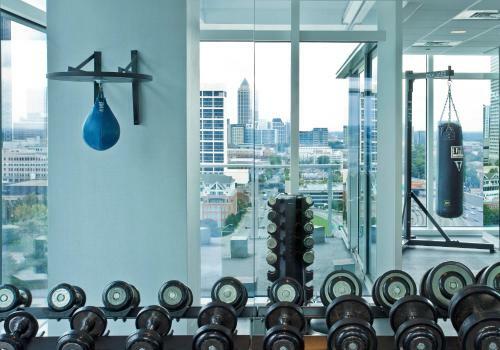 Working out is easy in the state-of-the-art 24-hour fitness center while a swim and cocktail await at the outdoor pool on the 16th floor with city views. Enjoy a soothing massage or mani/pedi in the spa and relax in the separate men's and women's lounges then head to the bar for sassy drinks and ice chipped from the 300-pound block. Dinner is served in the hotel's bistro and friends can kick it up a notch over a game while the DJ spins in the lobby lounge bedecked with a 22-foot waterfall and 35000-piece mobile. Room service is available around the clock and corporate guests have a business center and extensive meeting space. Valet parking is available and pets are welcome both for a fee. Reigning one block from I-75/85 the W Hotel Atlanta Downtown is less than a 10-minute walk from the Georgia Aquarium World of Coca-Cola and AmericasMart. The hotel is about 11 miles to Hartsfield-Jackson Atlanta International Airport. 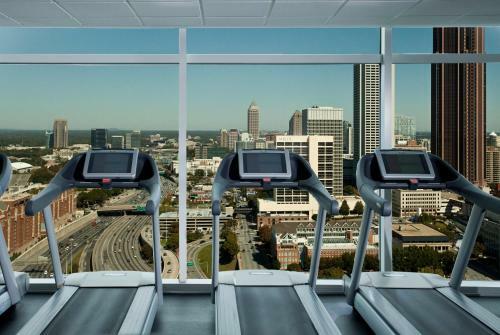 Add W Atlanta Downtown to your free online travel itinerary.